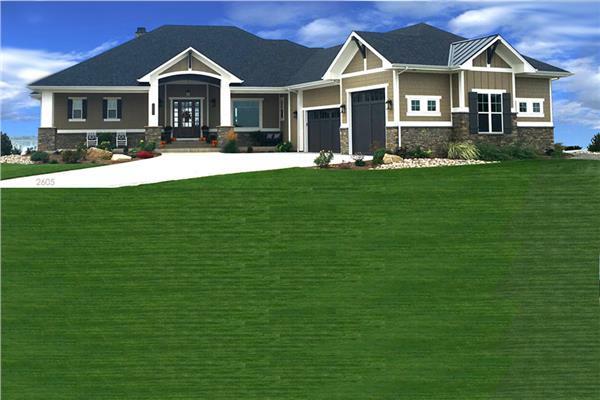 Modern ranch home plans combine a classic look with present-day amenities. The original design of the 1960s was considered luxurious for its wide, sliding glass doors that opened to sprawling backyard areas. Today, a new generation of ranch style homes offer more “extras” and layouts from which to choose. Ample patio and outdoor living space (perfect for summer grilling!) that helped popularize this style home from the start. The beauty of a ranch house plan is its flexibility. This classic style can be adapted to any family configuration. To add square footage, explore the option of adding a basement. Building on a basement rather than a slab foundation increases livable and storage space, and means less exterior area to finish. The master suite is typically on the main level, but the basement space allows for more bedrooms to be built. A basement foundation is the most common variation of the traditional one-story ranch-style home. These homes can also adapt based on the size and shape of your lot. There are deep plans available for lots that go further back, and wide plans available for lots that are the opposite. Simple in their design, ranch plans first captured the imaginations of the post-WWII American middle class in the 1950s and ’60s. During this era of rapid suburbanization, lots of homes were affordable, and the ranch style house had mammoth appeal. The popular California Ranch (as they were originally called) featured a long rectangular shape with a shallow-pitched hip roof that extended across a single- or double-car garage. They were a comfortable size – typically three bedrooms and two baths – contained neatly on one floor. In the 1980s and ’90s, this style lost ground to multi-story “McMansion” style housing trends, with buyers and builders adding more square footage per plot of land. Fast forward to the present. Today, ranches are enjoying a renaissance. Designers are looking back to original ranch style home plans as inspiration for versatile, high-value single story homes – and in many cases, luxurious homes. They offer cost-effective square footage, open and harmonious common areas that are well suited to entertaining, and everyday living made accessible without the need for stairs. Our collection of plans includes homes with modern amenities and features, while pulling some style inspiration from the classic ranch. These homes will suit anyone’s set of updated tastes and preferences, including those who are looking for exterior finishes beyond just brick. Whether you’re searching for an affordable, simple ranch house plan or a more luxurious design, browse through The Plan Collection’s portfolio of more than 3,000 unique ranch home designs.